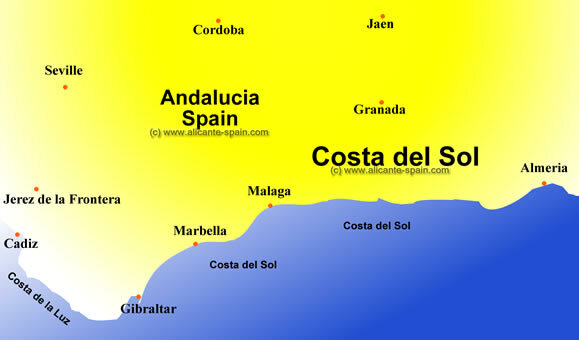 The detailed Costa del Sol map shows all major sites and cities around this beautiful area. 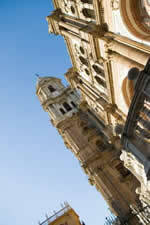 To the east, right on the map you see the city of Almeria at the beginning of the Costa del Sol area . 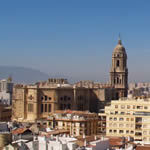 Following southbound the coast line, or to the left of the map, lies the city of Malaga with its impressive old historic city center. Further down the Costa del Sol map comes the famous glamorous city of Marbella , to some also know as the city of the rich. A little further at the southern end the Costa del Sol is ending around Gibraltar. As you can see on the map, the Costa del Sol area is the perfect place to start your holidays, especially if you want to visit some of the most attracting cities around Andalucia. Its close distance to Granada, Jaen, Cordoba and Seville make it the perfect starting ground for sunny and cultural holidays in southern Spain. Even cities like Jerez de la Frontera or Cadiz near to the portuguese border are in hours reach from the Costa del Sol in Spain.